There is nothing pleasant about surrendering. Surrender means that you did not get what you desired, your plans did not work, or simply that you lost. Several years ago, my husband and I visited Appomattox, VA which is where General Lee surrendered the Confederate army in the civil war to General Grant. As we visited this landmark, I told my husband that General Lee must have felt like such a failure as he rode back to his headquarters (which were tucked deep in the woods). It is hard to imagine the emotions that he must have been feeling. Defeat, failure, and discouragement had to be close at hand. Yet, his surrender and the South’s defeat was not the end for Lee and the United States. Our country remained unified because of Lee’s surrender and Lee went forward to other leadership positions. When God asks me to surrender, it usually produces a struggle between release and hold-on. I want what I want, but I also want what God wants. After a time of battle within myself, I surrender (typically my plan is not working). With God’s help, I begin to surrender and trust in His plans and purpose, even when it is hard. 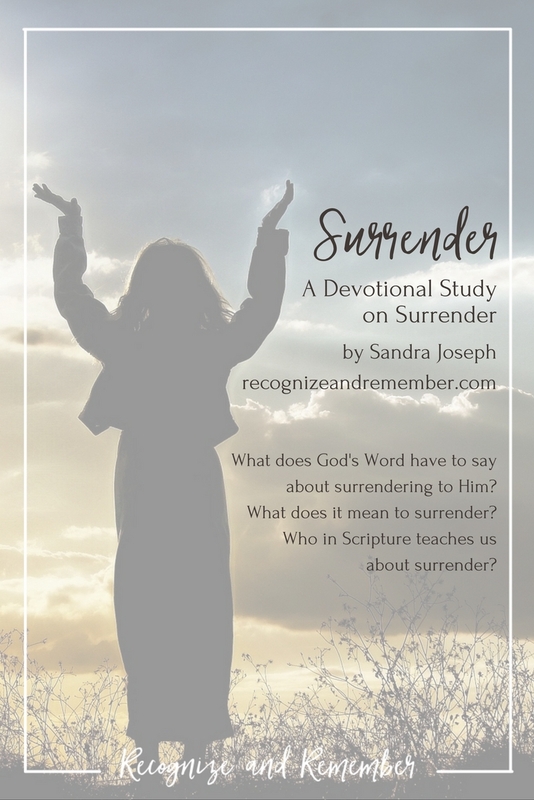 I am glad to introduce the Recognize and Remember’s Devotional Study on Surrender. Join me as we dig deep into the study of a young Mom who surrendered her precious son and trusted God’s plan for his life. This woman’s surrender ultimately fulfills God’s purposes for His story of redemption. I love how God uses women like you and me. To participate in the study, just fill out the form below, click to confirm in the email you’ll receive, then the study will arrive in a second email in your inbox. I look forward to discussing the study with you!